The Groundhog is a sturdy vehicle built for scanning and surveying purposes. 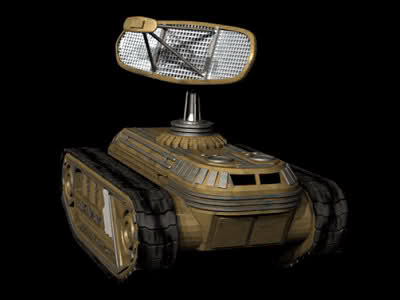 It has a 360 degree revolving scanning array mounted on the top of the vehicle. The scanning array is connected to a state of the art electronics system allowing data to be analyzed quickly and efficiently, providing accurate output information. This allows the Groundhog to locate future mining locations quickly in order to commence mining as soon as possible. The Groundhog is designed as a rather broad and flat vehicle to keep it balanced; this design is so efficient that the vehicle is stable even when traveling on the slopes of a mountain or rather rugged terrain. The vehicle has two small cockpit-windowpanes, made of transparisteel, and moderate armour plating for protection against falling rocks and extreme heat. The light armour combined with the higher than average speed, allow it to escape from and survive most light attacks.